We live in a digital age – I’ve got a camera, my wife has got a camera, my children have cameras – we’ve got phones taking images and video. What do we do with it all? 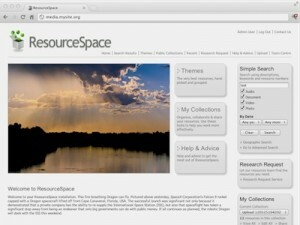 What I’ve done is install a brilliant Digital Asset Management system on my website called ResourceSpace . ResourceSpace is a piece of free software, both in cost and in concept, which was developed for Oxfam and then donated to the world. It really is fantastic. We use it at work to manage all of our digital assets, currently for 1,000 users and over 300,000 assets and it has operated faultlessly since we installed it nearly two years ago. Compared to the commercial offerings that we looked at it lacks few things – and those it does lack, we are planning on investing in the product to enable these tasks. It will easily manage your photos, videos, pdfs, spreadsheets, documents and pretty much anything else. It is completely extendable and multiuser enabled. It’s so good that I use it to manage my personal digital assets as well.Thanks to Dan and the team for creating this wonderful thing and ensuring that it keeps on developing.